I arrived to the race a little late, so I was forced to start in a later corral than I should have – H instead of F. As I lined up at 47th St and 1st Ave, I got ready for my 3.1 mile journey. Heading south on 1st Ave was a bit slow as I had to dodge people in front of me who were walking or were running with their children. We turned right on 42nd St and we began to see the sights of NYC. Runners filled the street as far as we could see as we headed west and ran past Grand Central Terminal. We turned right onto 6th Avenue at the one mile marker and headed north past such landmarks as Rockefeller Center and Radio City Music Hall as we approached Central Park. We turned into the park at the southwest corner and began the approach the marathoners would take the following day. We headed up and around the Sheep’s Meadow to the lower loop of the park which curved around to the west side drive. As we ran north, we could see the fences then the flags that runners would see as they approached the finish line of the race. The stretch led us up and let us finish our race where others would finish their 26.2 mile journey the following day. 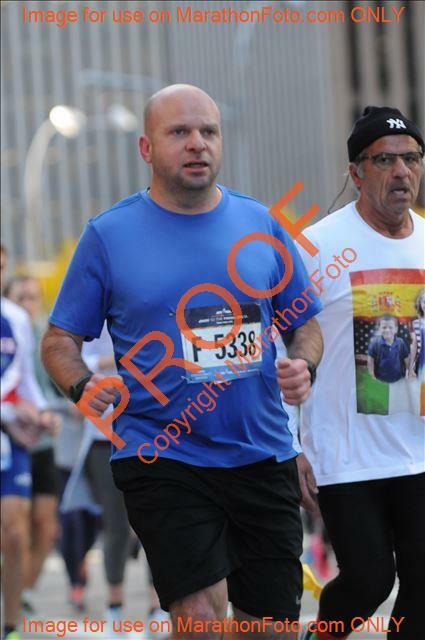 Being in a later corral than I should have been definitely affected my time, completing the race in 26:44. Not the time I would have liked, but it felt good to see the marathon finish and have it inspire me to run it again next year.